Cannabis legalization arrives on October 17, 2018 making it legal for individuals 19 years of age and older to buy, use, possess and grow recreational cannabis in Ontario. As a child welfare organization, keeping cannabis out of the hands of youth, and keeping kids safe, is of utmost importance. 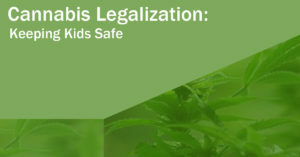 Regulations to prevent underage use of, and child exposure to cannabis can be found in the Cannabis Act. The documents below are helpful resources for parents and caregivers of older children and youth. To find more information, please visit the Government of Ontario’s website.